Transforming high quality content into clear and meaningful content for online consumption requires deliberate instructional design decisions. A good instructional designer knows about learning and how to support it. There are so many key elements from the macro down to the micro that will determine the quality of a course. A well designed course is clear in its instructional goal and every aspect of course design is aligned to that goal, from the biggest to the smallest design decisions. In this post we’re going to examine the macro aspects of instructional design and their role in achieving the instructional goal. Here we’re going to examine the ‘macro’ levels of course design. We look at how people actually learn and the application of principles that support the learning process. These guiding principles become the foundation of any educationally sound eLearning course, which seek to place the learner at the center of the learning experience. The challenge when designing eLearning courses which draw on the use of multimedia is to examine how technology can be adapted to aid human learning, and not how human learning processes should be altered to adapt to technology. Course design should be based on a cognitive theory of how people learn and draw on scientifically valid research findings. Let’s first take a step back and look at the concept of learning. The purpose of learning, irrespective of its medium, is to change what the learner knows, whether it be facts, processes, concepts, beliefs or strategies. Effective learning will then positively change behavior as a result (Clark & Mayer 2011). Mayer (2005) references three metaphors of learning as shown in table 2 .1 . Whichever methodology you align your beliefs to will ultimately inform your course design decisions. For the purpose of this paper we’re going to examine the ‘knowledge-construction’ metaphor and its implications for course design. Knowledge-construction draws on the work of Piaget who contends that humans are not passive recipients of information, but seek to generate knowledge by actively engaging in cognitive processing. Learners mentally organize relevant information into coherent structures and integrate them together before consolidating them with prior knowledge. The key here is ‘cognitive’ processing. Cognition is the process of learning and includes aspects such as awareness, perception, judgement and reasoning. The mind uses existing knowledge and then generates new knowledge. It can be a conscious or unconscious process as well as concrete or abstract . Active processing: learning occurs when people engage in relevant cognitive processing during learning (i.e. active processing assumption). These principles are presented diagrammatically in figure 2.5. Integrating: proceeds to integrate both the verbal and pictorial representations with each other and then with prior knowledge. (Clark & Mayer 2011). For the purpose of clarity words can be printed (on screen text) or spoken/narrated (audio), and graphics can be static (photos, graphs, charts, maps) or moving (videos, animations). A multimedia presentation is essentially any presentation that includes both words and graphics. Our focus here though is on the use of multimedia in eLearning course design. The principle is not applied by merely including pictures after the fact that serve as decorative elements as opposed to supporting the instructional goal . Words and pictures should be coupled on the screen in a meaningful way to allow learners to seek a coherent connection between them and then integrate them for the purpose of deep learning. Graphics can serve different functions in your course. 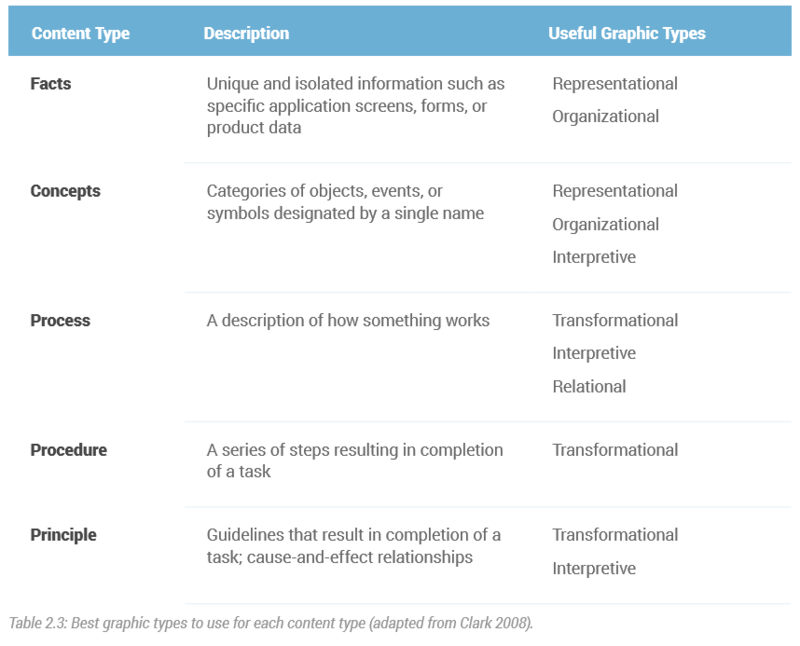 Take a look at table 2.2 below outlining the different types of graphics and their functions in learning. 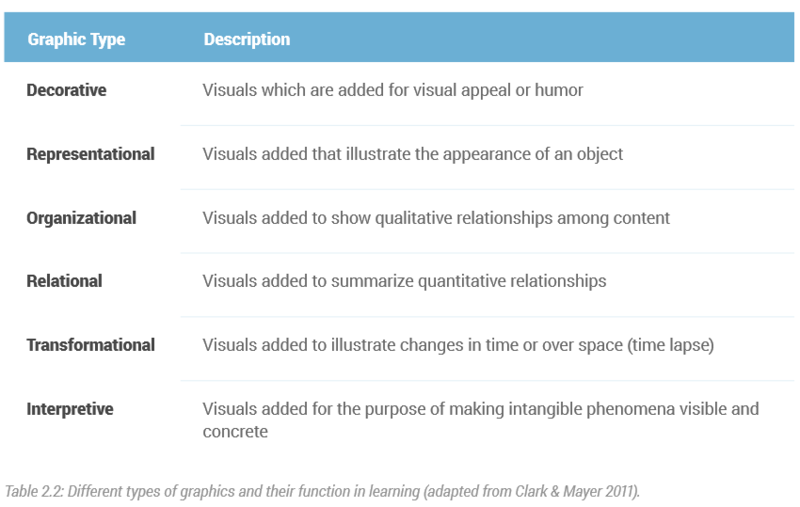 Table 2.2: Different types of graphics and their function in learning (adapted from Clark & Mayer 2011). When it comes to graphics, are static or animated ones better? A study carried out by Feng-Qi & Newby (2012) found that the use of different types of graphics resulted in significantly greater levels of learner performance when compared to those individuals who did not receive some form of graphical intervention. Surprisingly however, several weeks after the initial test those learners who were exposed to static graphics outperformed those who had been exposed to animated ones when retested. It has also been suggested that visuals with fewer details and a simple design style (e .g . a line drawing) resulted in better learning. Static graphics appear more conducive to learning as they allow for active processing as learners have to imagine and animate the changes themselves . Conversely animated graphics can foster passive learning and remove the ability of the learner to control the pace. In addition animations can often be too complex or too fast to be accurately perceived and can prompt cognitive overload (Tversky et al. 2002). So considering the cost and time involved in creating animated graphics, you should use static ones, unless you have a compelling instructional design rationale for animation. Irrespective of which type of graphic you use, they should be of a high quality. Poorly pixelated images or badly edited animations and videos send out a message of indifference to your target audience . It is a balancing act, but even a superficial understanding of these processes and their impact on learning and the types of graphics to choose, will allow you to design a course that places the learner at the center and optimizes learning. Ongoing research into the application of the multimedia principle has yielded multiple additional principles . 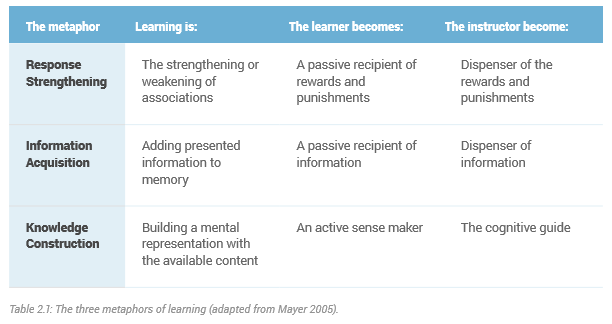 When followed they allow for the development of an eLearning course that balances the demands on the cognitive processing capacity (Clark & Mayer 2011) . Rather than overwhelm you they should be viewed as guiding principles that will actually make the process of designing your courses easier and certainly more effective. The principles discussed in the following pages are based on the work of Clark & Mayer (2011) and are available in their comprehensive book ‘eLearning and the science of instruction’.